1.Can I supply my own printed circuit board components? First Choice Assembly are happy to use customer supplied components (free issue). On receipt in our goods inwards area each component is labelled and placed in its own location within our stores, segregated from our stock. If required these components can be entered on to our MRP system in order to control the stock levels in the same way that our own purchased components are treated. 2.How long is a quotation valid? Thirty days from the date of the quote. Due to exchange rate fluctuations we cannot hold the price any longer than this. 3.How much is tooling and what does it consist of? Tooling is an initial one off charge to cover two things. When a bare PCB is first put into production film work has to be made in order to produce the PCB. The cost of this is about 20USD depending on PCB type. If the PCB is a complex double sided PCB with fine tracks or a multilayer printed circuit board then we suggest bare board testing (BBT) to test for circuit continuity. This charge does vary depending on circuit/test complexity. 4.How long does it take to get a quote? 5.What forms of payment do you accept? And what are your Payment Terms? We accept payment by Paypal or Direct Bank Transfer, Cheque or Credit Card. For new customers we expect first order to be paid in full on placement of order. This allows to us begin the process of Credit Checks and Account Opening. On successful processing of our Account Application our standard trading terms are Nett: 30 Days. 6.Are the PCB’s made in Shenzhen? The answer to this is YES. PCBSINO has provided manufacturing solutions in China for many years now. Every job will be assessed in terms of Volume, Technology, Lead-Time as well as consideration of the future needs of any project rather than just on a single order basis. A decision is then reached where best to offer as a manufacturing location. 7.What Volume range can you offer? 8.What is the fastest lead time you can offer? 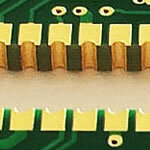 Many times PCBSINO have been challenged (and succeeded) to offer a 24 hour turnaround for PCB’s.! Whilst this is by no means the norm, we like to think that ANY reasonable request for delivery can be accommodated. A standard Prototype batch would normally be manufactured in 3-5 days and a standard Production Batch would normally be manufactured in 10-15 days. 9.What is a microvia hole? According to the new definition within IPC-T-50M a microvia is a blind structure with a maximum aspect ratio of 1:1, terminating on a target land with a total depth of no more than 0.25mm measured from the structure’s capture land foil to the target land. 10. What is meant by a blind via hole? It is a hole that runs from an outer layer to the inner layer, but not through the entire PCB. These holes can be drilled mechanically or using laser technology.The image in point 1 shows a laser drilled blind via. 11. What is meant by a buried via hole? This is a hole that runs between one or more inner layers. They are normally mechanically drilled. 12. What is a HDI PCB? IPC-2226 defines HDI as a printed circuit board with a higher wiring density per unit area than conventional printed circuit boards (PCB). 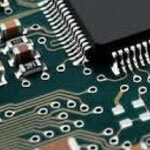 They have finer lines and spaces ≤ 100 µm / 0.10mm, smaller vias (<150 µm) and capture pads <400 µm / 0.40mm, and higher connection pad density (>20 pads/cm2) than employed in conventional PCB technology. 13. Are there different types of HDI features? The graphic below shows the main structures – type I, type II and type III as defined in IPC-2226. Type I. Defines a single microvia layer on either one or both sides of core. Uses both plated microvia and PTH for interconnection, employing blind, but not buried vias. Type II. Defines a single microvia layer on either one or both sides of core. Uses both plated microvia and PTH for interconnection. Employs blind and buried vias. A charge will also be made for a frameless laser stencil 20USD if the PCB is surface mount. This is to enable solder paste to be screen printed onto the PCB to allow for assembly of the component onto it. The solder stencil is produced from the Gerber data used to make the bare PCB. Solder stencil can be made with 24 hours. These charges are only an indication and can vary depending on order value and can be free. 14.I ordered the wrong service. Can you add soldermask and silkscreen to my boards? 15.What is the UL rating of your FR-4 material? 16. How can I get a stencil made for my PCBSINO board? 17.Do you accept purchase orders or COD?